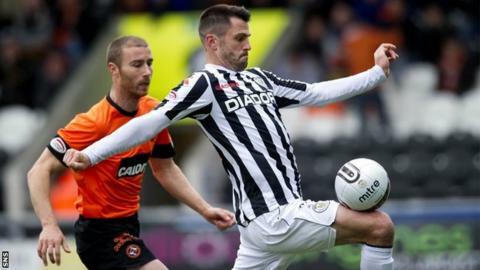 St Mirren manager Danny Lennon felt his side found their indentity again, despite losing to Dundee United. The Buddies, who were beaten 5-0 by Celtic last week, suffered after Johnny Russell converted a penalty. "There were a few questions raised about the boys' character last week and I thought we showed that in abundance," said Lennon. "To lose in the manner we did was very disappointing." Lennon's side controlled possession for large periods in Paisley but struggled to break their visitors down. "In terms of possession, we had large periods of the game," added Lennon. "We must have set a club record in terms of getting crosses from wider areas, I'm not saying they were all quality [deliveries]. "It was our end product that let us down. "If we play more of that type of football, we'll certainly win more games than not." Meanwhile, Lennon says midfielder Kenny McLean, a late withdrawal from the team that faced United because of injury, has a good chance of being fit in time to face Aberdeen in Tuesday's Scottish Communities League Cup quarter-final at Pittodrie.